Photo by Marieke de Koker. 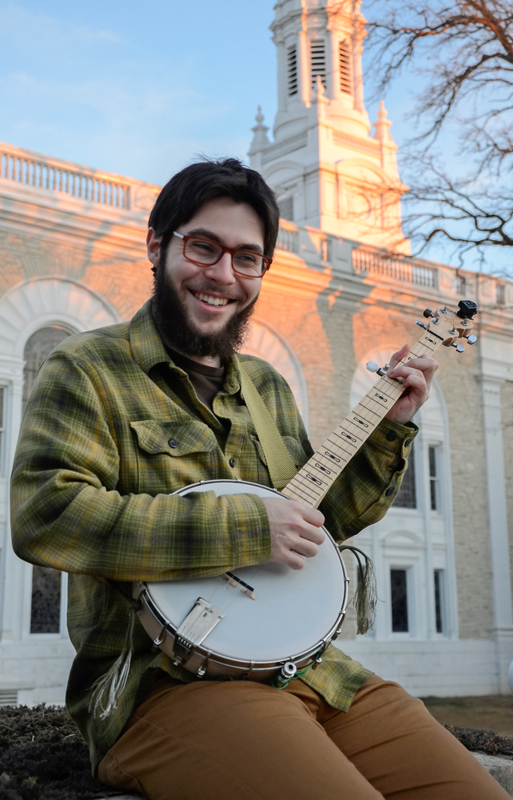 Senior philosophy major and creative writing minor Izzy Yellen puts his passions for music and writing to work in a variety of ways. Many might know him from either of his two radio shows or from his articles in The Lawrentian, projects which Yellen has worked on throughout his time at Lawrence. He hosts one WLFM show—a combination of music and banter—with a friend, and hosts the other— Essential Albums, featuring a variety of guests speaking about their favorite albums—solo. Essential Albums has been in production since Yellen’s sophomore year, as has his column. Yellen says that, through his column, he has been able to “polish [his] straightforward writing and voice an emotional connection.” But more important than that, he says, is the fun he has had doing something he loves: writing about music. Outside of Lawrence, Yellen has taken his writing skills to DownBeat, the Chicago-based international magazine devoted to “jazz, blues and beyond.” Having started there as an editorial intern the summer after his sophomore year, Yellen now continues his work while home on breaks, writing and editing for DownBeat’s print publication as well as their website. Yellen says he loves the freedom the job allows him in choosing what he wants to write about. He is also working to curate a zine—a DIY magazine—where he will feature the wide-ranging work of many diverse artists. Giving other passionate artists a platform—through his writing, radio shows, and other outlets — is part of what Yellen loves about what he does. A more recent interest of Yellen’s is improvisational songwriting. The pieces he’s been creating are “less composed” and combine his musical improvisation with his poetry and prose. His instrument of choice is banjo, selected primarily because it is so inherently different from Yellen’s first instrument, the trumpet. He likes to start simple—a single note, perhaps—and then manipulate the sound with a pedalboard. As for the influences on his current sound, Yellen credits free jazz and improvisation, Yo La Tengo, Animal Collective and other experimental rock bands. Future projects include an album or two, to be released in the coming months, and a few screenplays. Yellen’s current screenwriting class has given him the support to explore longer narratives. Some of his screenplays are subtly related to music, but not all. Between his many mediums of expression, Yellen has found a lot of overlap that enables him to bring new and creative work to Lawrence and beyond. With a strong love for the often overlooked Chicago indie jazz scene, Yellen plans to bring his talents back to the Windy City after graduation to work in freelance journalism and write and perform his own music.